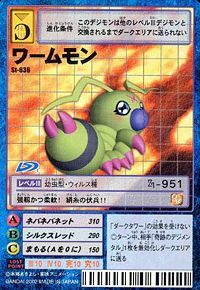 A Larva Digimon with a timid, cowardly personality. 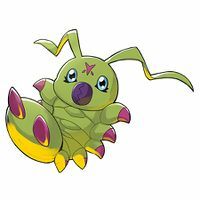 Just like V-mon and the others, it's a descendant of an ancient species, so it is able to perform special Armor evolutions, but since Wormmon is powerless when by itself, it can't possibly match up to larger Digimon. However, by Armor evolving with the power of the Digimentals, it is able to manifest unbelievable power. Also, it is said that in order for the fragile larva to grow into a powerful imago, Wormmon will one day evolve into an Adult overflowing with power. 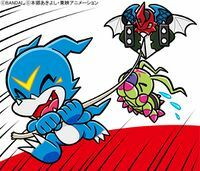 It can definitely be said that it is a Digimon who has hidden potential for the future. 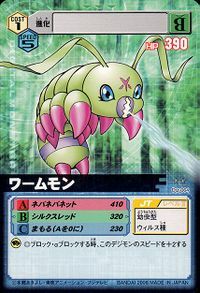 Its Special Moves are spitting out the threads of a tough, adhesive net, completely restricting the opponent's movements (Nebaneba Net), and spitting out stiff threads that are as thin as a silk thread but as pointed and sharp as a needle (Silk Thread). 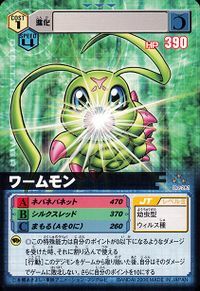 Anime/Manga Digimon Adventure 02: "The One who Inherits Courage"
Nebaneba Net  Sticky Net ネバネバネット Nebaneba Netto Sticky Net Shoots a net of webbing to trap the foe. Shoots a strand of needle-like silk thread. 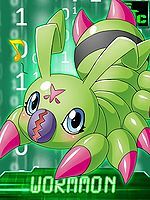 Flips into a ball and hops into the air to whip the opponent with antennae. Slaps foe with a strand of silk. Shoots out silk in the shape of a hand to grab objects. 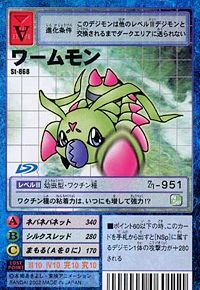 ワームテール Waamu Teeru Rotating Tail Attack Spins around and scratches foe with pincers on rear. ワームホイール Waamu Hoiiru Rotating Head Slam Spins into a ball and rams enemy. Jumps in the air and spins to attack. Nebaneba Net Kai  Sticky Net Revision ネバネバネット・改 Nebaneba Netto Kai Modified Sticky Net A variation of Sticky Net modified with the smell of nattō. Sticks to a surface, allowing it to scale it, or attaches itself to an enemy to headbutt it repeatedly. 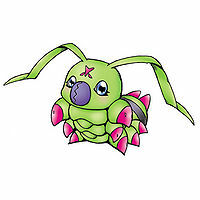 Wormmon with Ken when he was the Digimon Kaiser. 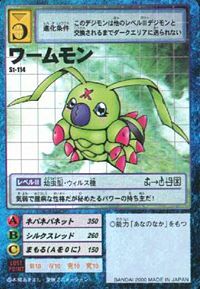 Wormmon is the partner of Ichijouji Ken. 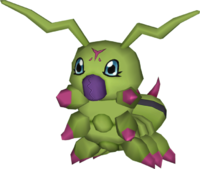 Wormmon is an available character, and evolves to Stingmon. Can be found at Bug Bug Jungle. He can evolve to Stingmon if above level 15 and Defense above 65. 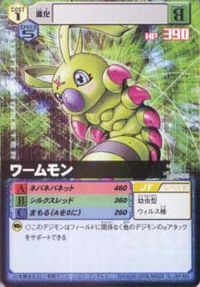 Can be evolved from Minomon if above level 10 and friendship 50%, or can be found at Register Jungle. 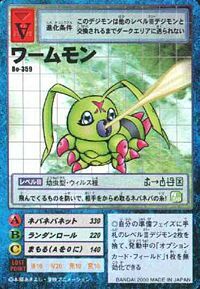 Can evolve to Stingmon if above level 23, defense 110, and speed 115, or Snimon if above level 19 and attack 90. 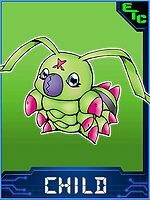 Wormmon is an unlockable fighter. 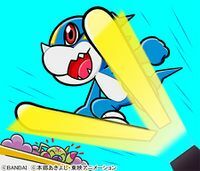 His main evolution is Stingmon, and his Super Evolution is Imperialdramon: Fighter Mode. It can also be obtained as a collectible DigiCard. 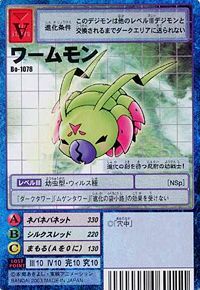 Wormmon is the partner of Mishima Erika. He evolves to Hudiemon. 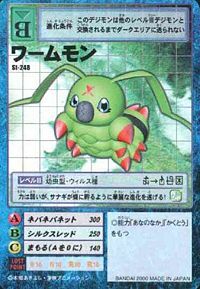 Wormmon is an obtainable Digimon in Version 1 of the D-3. It's weak and cowardly, but hides great power! Hidden within its kind personality are its abilities as a descendant of an ancient species! Although it is weak, it waits to carry out a spectacular evolution, akin to how a pupa grows into a butterfly! It ambushes its enemies with its sturdy, yet soft, silk!! Could it be that Vaccine attributes possess more potent stickiness!? It protects itself from incoming attacks, and stops the opponent in its tracks with its sticky string! This young warrior patiently endures the wait for its evolution! Although it is timid and weak, it is filled with earnest kindness. As a descendant of an ancient species, it is capable of Armor Evolution through the use of Digimentals, and is said that it will draw out unbelievable power as it grows. This page was last modified on 8 April 2019, at 01:53.